Hey Tampa Bay, Alex here to tell you about my personal experience at The Tampa Bay History Center. I began my day with a tour of the two story museum. I got to see all of the major exhibits, the gift shop and event space. This museum is filled with a plethora of information on Tampa’s historical chapters with interactive games and videos for children and adults. After the tour, I then went back into the museum to view a few exhibits that interested me. First, I checked out Coacoochee’s Story Theater, which immerses vie wers in the interesting account of Seminole Chief Coacoochee’s experiences during the Second Seminole War through videos and "Disney- like” dioramas. I then headed over to Cigar City, which chronicles Tampa&apos;s cigar industry and immigrant communities while featuring one of the most extensive cigar memorabilia collections in the world. This section was my personal favorite. Everything from the architectural design of Cigar City to the mini- videos on Ybor’s history and social life made me feel like I had taken a step into Tampa’s past. I spent the majority of my time in this section because I was fascinated with the videos that took you back in time through research information and interviews with some of Tampa’s older locals. I ended my visit with a café con leche and a "signature" 1905 salad at the Columbia Café. This is the perfect restaurant to have at Tampa’s History Center. Not only do you get to indulge in wonderful food, you get the feel of Tampa’s History through the restaurant’s decorations and menu. 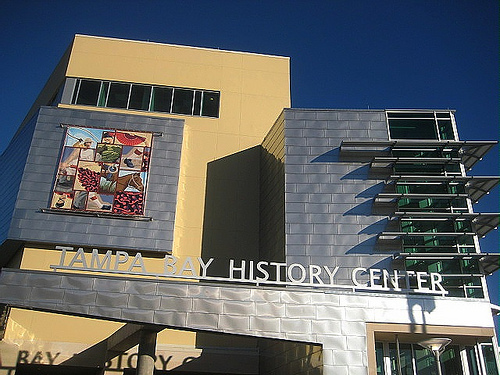 Now, go head over to the Tampa Bay History Center to enjoy a great day of learning, fun and good food! That&apos;s it for now, but stay tuned in for more updates on Arts and Culture in Tampa Bay!